Annette Perry was born on August 13, 1952 in Stephenville, Texas. She moved to Mansfield in 1963 and graduated from Mansfield High School in 1970. Mrs. Perry began her education career in the Head Start program in Mansfield ISD in the summer of 1970 followed by seven years at Alice Ponder Elementary. While teaching in 1978, Annette married Gerald Perry. She left the Mansfield school district to teach in Bryan ISD for two years before returning to Mansfield ISD for 25 years. She finished her career at Erma Nash Elementary teaching resource, STAR, FALS and PPCD. She served as the Special Education Team Leader for many years at Erma Nash as well as helped develop and implement a successful Inclusion Program. 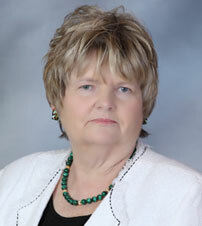 Annette Perry retired from Mansfield ISD in 2008 after 34 years as a dedicated educator. She and her family attended the dedication ceremony of our school building on January 10, 2010. She immediately volunteered on our campus as a reader to our students. Just a short time later, after the close of the school year, she passed away at the age of 57 on June 13, 2010. Her beautiful imprint and love for reading resides forever in the spirit of us FALCONS.